Well, I picked up my first negative review for Swords of Talera. Ouch! Amazing how much it hurts. What’s worse, I asked for the review. Double ouch! Also, I was sort of expecting it to be good since I recieved an email from the reviewer in late September saying: "I finished Swords of Talera. I enjoyed it very much." Triple ouch! I first wrote “Swords” when I was 24, and though I polished and repolished the manuscript before it was published as a paperback I knew it suffered a bit in the plot department because of my youthfulness at the time it was constructed. I didn’t think it was as good as the two sequels, Wings Over Talera and Witch of Talera, but I did believe that the fast pace and the characters of Ruenn, Jask, and Rannon would carry readers along. Not so much, I guess. At least not in this case. Now I'm going to have to go back and revise my post on my writing strengths, take out the "action scene" one. One of the reasons why I posted my "Rainbow's Fall" dream yesterday is because I'm preparing a presentation for this Sunday on the topic at the local Pagan Pride Festival. Part of the focus will be on how to improve recall of your dreams. Among other things, don't drink caffiene or take any kind of sleep aid before bedtime. These usually interrupt dream sleep. I also suggest that people keep a small tape recorder by the bedside as a quick way to record dream images and impressions without the hassle of turning on a light to write by. I'll also be talking about dream sleep disorders such as sleep paralysis, Narcolepsy, and REM without Atonia. And about hypnogogic and hypnopompic phenomena. Hypnogogic events are very sudden, dream-like incidents that happen as one is going to sleep, while hypnopompic events are similar things that happen as you come out of sleep. I've had a fair number of each experience, and I firmly believe that these and some other sleep state events can explain many cases of so-called astral projection, demonic or ghost contacts, and even alien abduction experiences. In one of my hypnopompic experiences I witnessed a shape moving underneath the bed sheets and was grabbed around the wrist by it. Quite terrifying while it was occurring, though afterward all I could think was...cool! * I come walking across a winter heath with a rainbow arching through gray skies above me. Sharply there comes a splintering crack, like ice breaking on a spring river, and I look up to see half the rainbow hanging down from the other half like a twisted limb. Once imprisoned colors begin to spill down, blues that change the sky’s hue to summer, greens that make me think of bare feet in deep grass, then yellows and oranges that sundown the world. Last come the reds, pouring out like angry blood. When the rainbow is empty it hangs like a crystal holograph in the sky, until it cracks again and tumbles madly in pieces to the ground. I go on across the heath, through colors that clump and cling like mud to my boots, until I find where the rainbow has fallen. It lies in chunks, like twisted boxcars from a wrecked train. I enter the first such “car,” and then the next and the next, to find piled within all the garbage that the human race has thrown away over the years: one tennis shoe without laces, a broken tin top, sandwich wrappers, a rusted out stove, a chair with the cane back smashed in, nylons with the toes stripped, clothes stained with tobacco and oil. Further along through the fallen rainbow are older discards: gnawed bones, a misshapen flint, a shattered spear. When I come to the last section of the rainbow, I cannot enter. I can see dimly through to the other end, and outside stands my house, the goal I have been tramping across the heather to reach. But shadows roil in the space before me, between where I stand and where I want to be. The breeze dies when it enters that place. But something moves. Something lives. I see need the color of black. I hear rage like a pressure against my ears. Something waits, but cannot control itself enough to wait silently. That is its downfall. I turn and trudge back the long way through the trash. * This is an actual dream I had quite a few years ago. I’ve tried before to capture it in prose, have tried in poetry. Nothing quite works, but it was certainly an interesting dream. Like the obsessive compulsive that I am, I keep records of what I read each year, and I date my reading year from my birthday rather than January 1. Said birthday being today, October 14. (Lana's is October 13, btw.) The 06-07 year was a good one for me. I read 100 books, which is above my usual average. But my total was helped by deciding last year that I was going to read some shorter books and more poetry. The 9 poetry collections I got through didn't take a lot of time. Other than that, nonfiction was my highest category, with 19. Mystery/thriller followed at 18, and then 17 and 14 respectively for fantasy and horror. 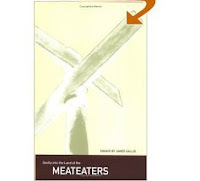 The best book I read this year was Gently into the Land of the Meateaters by Jim Sallis, which is a collection of his essays. The worst one was the Werewolf one that I blogged about on September 3 under the title "Altering Point of View," and another weak one was a collection of Japanese Cthulhu Mythos stories that I had to read for a review. The most interesting poetry collection I read was Charles Bukowski's Love is a Dog from Hell. For the new reading year I've decided to focus on big books, and, accordingly, have started Red Mars, at over 570 pages, by Kim Stanley Robinson. The first 15 pages nearly wrecked it for me. It was essentially an "epilogue" to the story, and I was within a page or two of tossing it before it started to get interesting. Once he went back and started on the beginning of the story on page 26 I quickly found myself hooked and am reading avidly. As for writing today, I'm going to simply refer you to an excellent piece by Steve Malley entitled "As Above, So Below." Lot of good stuff in this one. But seriously, we had a great day. The ceremony was short and sweet and Lana looked beautiful. Many pictures were taken by our friend Katya, but she has to download them for us. I will be posting some in time. Afterward, we took the entire wedding party to dinner at Trey Yuen, the best Chinese restaurant I’ve ever eaten at. Of course, the entire party consisted of Lana, me, Katya, my son Josh and his girlfriend Heidi, and Mark, our friend and minister. Today we plan to have a picnic and then spend the weekend relaxing and enjoying our deck. It’ll be a quiet honeymoon, just like we like it. In other items, I’ve been tagged by Lisa over at Eudaemonia to list five of my writing strengths. This has proven quite difficult because I keep wanting to qualify whatever strengths I come up with. I wonder why writers so often have trouble tooting their own horns. Anyway, here is the best I can do. 1. I do a pretty good job at description. Most people say they have no trouble visualizing what I’m writing about. This can be a bit overwhelming for some folks when I’m writing horror scenes, though. 2. From years of reading, I think I have a pretty decent vocabulary. I know words like swive and ophidian and aspergillum and squamous. Unfortunately, one seldom gets to use such words. Sigh! 3. I can put together a decent action scene. This is probably because I really enjoy writing them. 4. I’m my own worst critic. I consider this a strength rather than a weakness. Whatever I write, I write it to the best of my ability. That ability may not be so great, but I don’t shirk my duty to the reader and I don’t let laziness make me send out a piece that I know is inferior. 5. Perhaps my most important strength is that I actually enjoy rewriting. It’s fun to take something as ugly as my first drafts and make them look decent. Rewriting has definitely been the key to whatever small success I’ve had. As for tagging others, I will politely resist the urge. I won't be posting today other than this brief comment. It's a special day for me. Lana and I are getting married! The ceremony will take place this afternoon on our deck. And we have a lovely cool day for it. And now I have a few things to do. From Lana and I both, we hope everyone has some joy today. Psychological research shows that when someone is given a list of words to remember they tend to recall best the words that begin and end the list. This suggests one important way that words of power can be used in writing. If we consider a sentence to be a kind of “list” of words, then the opening and ending positions in the sentence are the places to focus our most powerful images. The opening position creates the “primacy” effect while the end position produces the “recency” effect. Because the “primacy” effect is not quite as simple as it seems where writing is concerned, let’s consider the recency effect in this blog post. He rode with our enemies on a coal, black horse. He rode with our enemies on a horse as black as coal. For another example: A blade sheathed in cold copper hung at his belt. At his belt hung a blade sheathed in cold copper. This may be something that most everyone here already has a feeling for, but I don't think it hurts to stress it again. It's also pretty much exactly what Candice Proctor was talking about in her “Punch it Up” post, and it’s something we’ve been talking about a lot in our writing group lately. It just took me a while to realize that this is the same basic principle as the “recency” effect in psychology. Words of power can best work their magic on the minds of your readers when they are in positions of power. One such position is found at the end of a sentence or paragraph. Words of Power: A Summing Up? I’ve been having a terrible time getting connected to the internet today, both at work and at home. It has taken me forever to get some comments written, so if I haven’t gotten around to your blog that’s the reason. I did want to try and post some more on the “words of power” idea. Maybe if I copy and paste this I’ll be able to get it posted. First, thanks to everyone for their wonderful comments. I saw a lot of great words listed. While most words mentioned were nouns--“Iron,” “Bone,” “Sword”--there were some cool adjectives such as “Feral” and “Burning.” I was happy to see, for internal reasons, that not all the power words mentioned were concrete. The words actually seemed to come in three categories. “Fire,” “Gun” and “Mist” are pretty concrete, pretty visual. "Pain," “Midnight,” “Sunlight,” and “Adrenaline” are more amorphous. They’re sort of between the concrete and the abstract. “Fear,” “Evil,” and “Violence” are typically defined as abstract. The reason I was glad to see abstract words in folks’ lists is because I’ve had a running debate with some writer friends about words like “Violence” and “Soul” for some time. I’ve been told repeatedly that “Violence” is an ineffective word because people can’t visualize it. The problem with that argument is that I can visualize it. I’ve even gone so far as to respond with: “Violence is concrete.” I realize now what I actually mean. Words like “Pain” and “Fear” and “Violence” have a great deal of resonance, so much so that they call up plenty of concrete visuals when I see them used. 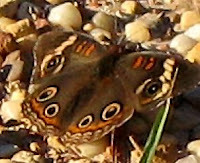 Yesterday I posted some of my power words, two of which created largely negative images in me. I don’t want to give the impression that such words are generally negative so here are a few of my more positive ones. Son: Little legs kick, little arms move. A smile from a crib. I hear a gurgling laugh. I see a small back, riding away for the first time on a bicycle. A young pitcher puts another strike across the plate. A boy near grown hugs his father. Fog: It’s morning. Sounds are hushed. The grass is thick with wet diamonds. Trees drip a faint, cool liquor to earth. A pleasant chill shrouds my walk, pats soft, damp fingers to my face. Every old curve of road is new again. Mysterious. Silk: I see a shimmer in dim light; my fingers caress a coolness that is sweet. She moves. A faint sound, too delicate to call a rustle, too soft to call a swish. Slickness clings, wrinkles, smoothes. Pupils dilate. Tomorrow or Monday I’ll post about some of the words that other bloggers have mentioned in comments here, and about ways to use these words in writing. Thanks to everyone who added their words. Some great stuff there. Interesting stuff. Certain words evoke emotions and associations. They punch you where you read. Like a moss-slicked boulder in a creek, they break your thoughts into eddies that must flow over or around them. Again, I would call this resonance. Snow: Goosebumps rise. My toes ache for fire. I see the cattle with white rime along their backs. Slush piles up on the corners of the truck’s windows where the wipers can't beat. Near the ditches the pale purity is churned into mud. But sometimes the light strikes blindingly from the distance. Blood: It stops me when I read upon it. I see crimson splatters on white. I see black and clotted gore with flies gathering, and necklaces of ruby on pale ivory throats. I see many things: like the red-wine stain that darkened the torn knee of my blue jeans after I totaled my motorcycle. Death: I see my sister's skeletal face as she lay dying from cancer. I hear the rattle of her breathing in her last moments. I see my father’s waxen pallor in the satin lined coffin, rosary beeds upon his chest. I feel my own wet cheeks. In the background there are battlefields, spent weapons fallen like frozen lightning. The ravens lift. What are your words of power? The words of power? Find them and you’ll find your muse. How do you feel about the use of symbolism in what you read? What you write? I confess that I’m not a big fan of deliberate and conscious symbolism as it is often used by writers. I’ve read books (Steinbeck anyone?) where the Christian imagery is rather overwhelming, and obvious. I don’t like being hit over the head with a writer’s point. I don’t like having them force my recognition of their philosophy or anti-philosophy. I did not, for example, find Pilgrim’s Progress a compelling read. This is one thing I didn’t care for in Kafka’s The Metamorphosis. I believe that George Lucas made better movies before he became so conscious of the fact that he was writing out Joseph Cambell’s concept of myth. On a lesser note, I tried to watch the new sitcom Cavemen last night but not only was it not funny, but it tried to symbolically connect the modern “caveman” experience to that of African Americans and those of Jewish decent in a way that I found incredibly trivial. On the other hand, I enjoy discovering symbols and meaning when it is subtle and serves completely the needs of the story. I love how Jack Finney’s Body Snatchers and Robert Heinlein’s The Puppet Masters can be read as indictments of Cold War paranoia. But, first and foremost, these stories stand on their own as stories. The symbolism, the relevance, is gravy. What Finney did was create a sense of “resonance” in his story rather than using overt symbolism. The power of this approach is that it is all about the “reader” and not the writer. The reader feels the currents passing underneath them. They know something is stirring in the depths, that it’s rising toward them, but it takes a while to figure out what. By the time they figure it out they are already engulfed with the awareness. And seldom will two different readers figure out the same thing. Such stories are very much a “build your own adventure” or at least “build your own meaning” experience. I may post some more on this topic because it fascinates me. I know I run the risk of insulting folks who like overt symbolism, but such is not my intent. Some excellent works exist where the symbolism is clear. But there are plenty of works that lack overt symbolism but still create a sense of resonance in the reader. I personally prefer the latter. How about you? 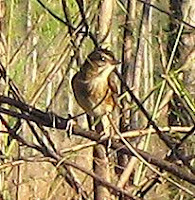 Lana and I went for a walk last evening at the Flatwoods Preserve, which I've mentioned here before. 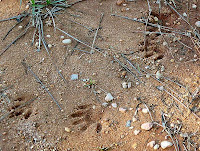 The Flatwoods is about a mile from our place and we've never seen another human there, although we have seen a few human tracks. 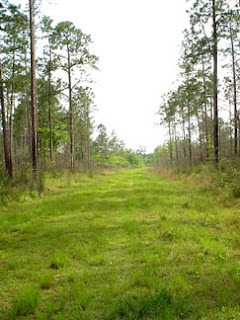 The Preserve is a place where conservationists are trying to maintain a combination of Longleaf Pine savannah and Bayhead swamp, some 90% of which has been lost in the USA. 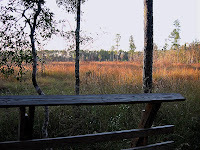 There is a boardwalk called "Pitcher Plant Trail" for all the carnivorous Pitcher plants that grow alongside it. 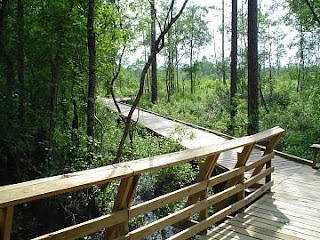 Below is a picture of the boardwalk. that I came within two steps of putting my foot down on a Cottonmouth Water Moccasin. He had clearly heard me coming because he had his mouth open toward me and I swear I could see his fangs dripping a clear and evil venom. (Ok, maybe I exaggerate about the clearness of the venom.) Let me tell you that I gave a quick little hop, skip and jump backward, said movement which was accompanied by a small shriek. Nothing seems to get the heart rate up like a snake in your path. In fact, we've seen snakes most of our times at the Flatwoods. Most have been non-poisonous but we did see a small Copperhead. Both Lana and I decided to wear boots next trip. Besides snakes, we saw four huge spiders, one green one and three of the yellow and black garden variety. One of the latter had only 7 legs. I guess there's a story there, a life and death struggle on a micro scale. How many of you have ever imagined what if you were shrunk down to insect size? I have. And I've always loved books and stories in that vein. My favorites were the three "micronaut" books by Gordon Williams, but there's almost enough of these kinds of stories to be a whole subgenre. I just read one called "Killer Pine," by Lindsay Gutteridge. This is one of a series about a micro spy. And, of course, there is TV/Movie tie-in with such offerings as Honey I shrunk the Kids and, my favorite, Land of the Giants. Imagine, you wake up one morning on a vast snowy plain. But it is a warm plain, a plain of cotton rather than snow. In the night you've been shrunken down. Your bed is now an unexplored world, full of it's own valleys and hills. In the distance you see a dark shape coming toward you across the white expanse. I guess you better hope you don't have bed bugs.